As I really loved doing my Helsinki Eats post a little while ago, I thought I should start a little series of similar posts about all the amazing restaurants dotted around London. I’m a South-Londoner myself so many of these post will probably focus on this area, but I will try to venture north of the river every now and then too to keep things balanced! As I live close to Brixton it felt like a natural starting point – hope you enjoy and feel inspired to try some of these out if you ever find yourself in South West London! This is a restaurant I’ve wanted to try out for a few years now but for some reason didn’t get around to doing until now. It’s quite a tiny, cosy restaurant with exposed brick walls and a bit of bric-a-brac decor. The menu has a kind of a tapas theme – the idea is to choose a few different small plates to share (or not..) with the recommended amount being about three portions per person. I was very happy about most of the things that I ordered and their drinks menu was on point as well – that chilli mojito was to die for! And did I like it? I loved almost everything – especially the wontons were amazing. They came with this lovely little pot of sweet chilli sauce and were really nice and crispy – I’m definitely going back for them! The sweet potato fries were good too, as can be expected, but I was slightly disappointed in the goats cheese salad, although only because I was expecting to get a bigger chunk of goat’s cheese and less of the actual salad… So technically that’s not the restaurant’s fault! Overall verdict: 3.5/5 – Loved most of my food and drinks, but the service, though very friendly, was really slow. Unlike Three Eight Four mentioned above, I hadn’t heard about Mamma Dough until a few months ago when we moved into our new flat. It’s on Coldharbour Lane as many other Brixton restaurants are, but it’s a little bit further along the road which makes it feel a bit more like a neighbourhood restaurant – albeit a very trendy one. As the name suggests, the food here is pizza, sourdough to be exact, and they’ve got quite a few veggie options as well which definitely gets thumbs up from me! And did I like it? I loved it! The crust was crispy and the toppings were something a little bit different – I though it all worked really well together. Butternut squash & feta turned out to be a great combination! 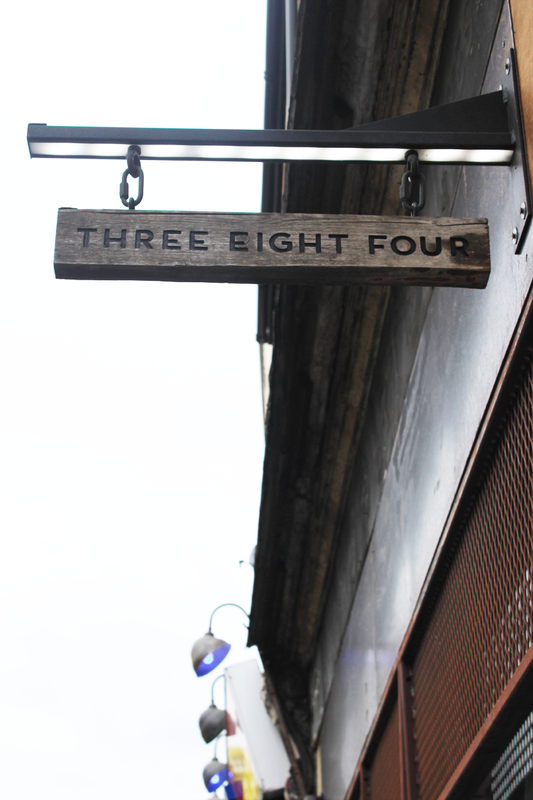 Overall verdict: 4/5 – Really good pizza in a really nice and rustic setting – recommended! Kao Sarn is one of the many Brixton Village restaurants I’ve been meaning to try out for ages and I finally made it a few weeks ago – and I’m so glad I did! It’s quite a small restaurant with a little seating space both inside and outside (the outside area would be perfect for a sunny day like today!). I was boring and went for what I always go for in Thai places – Green Curry – but all the dishes I saw looked really good as well so I would definitely go back and trial something else as well. And did I like it? Yes! The spring rolls were super crispy and came with my favourite, sweet chilli sauce, and the curry was very yummy too – it’s one of my favourite dishes in the world and I didn’t have to disappointed! Overall verdict: 4/5 – Good food and really fast service. As it’s in Brixton Village market there’s also a really great atmosphere all around.